RAM is proud to announce that our first associate member will be composer Gilbert Galindo. Gilbert will join RAM on an open-ended basis, composing for and working with at least one of our collaborating ensembles in 2011 and beyond. Click here to read up on Gilbert. His sound clips will be posted soon. For more information on Random Access Music, visit www.ram-nyc.org. The album (co-produced by thingNY and Brendan James) opens with the both earnest and absurd prologue, “Stories by Interesting People” but quickly becomes a montage of numbers, appointments, peeves, dreams and commercial interruptions in five-part harmony. 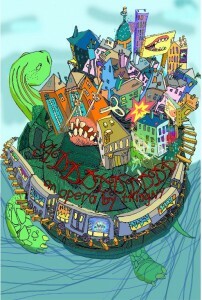 The accompanying comic book libretto features artwork from various artists and musicians, including some of the band. Curated by Mary Jane Leach.